This article is about the 1981 Polish film. For the 1925 silent film, see A Man of Iron. For 1972 Hong Kong film, see Man of Iron (1972 film). For the racehorse, see Man of Iron (horse). For the superhero, see Steel (John Henry Irons). Not to be confused with Iron Man (disambiguation). 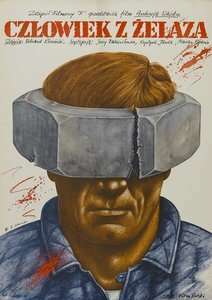 Man of Iron (Polish: Człowiek z żelaza) is a 1981 film directed by Andrzej Wajda. It depicts the Solidarity labour movement and its first success in persuading the Polish government to recognize the workers' right to an independent union. The film continues the story of Maciej Tomczyk, the son of Mateusz Birkut, the protagonist of Wajda's earlier film, Man of Marble. Here, Maciej is a young worker involved in the anti-Communist labour movement, described as "the man who started the Gdańsk Shipyard strike", and a journalist working for the Communist regime's radio station, who is given a task of slandering Maciej. The young man is clearly intended as a parallel to Lech Wałęsa (who appears as himself in the movie). Man of Iron clarifies the ending of Man of Marble, which left the death of Mateusz Birkut ambiguous. Man of Iron explicitly states that Mateusz was killed in clashes at the shipyards in 1970. The film was made during the brief thaw in Communist censorship that appeared between the formation of Solidarity in August 1980 and its suppression in December 1981, and as such it is remarkably critical of the Communist regime. Because of this it was banned in 1981 by the Polish government. The film won the Palme d'Or and the Prize of the Ecumenical Jury at the 1981 Cannes Film Festival. It was also nominated for the Academy Award for Best Foreign Language Film. The film is set in Gdańsk in 1980. In Gdańsk shipyard workers strike continues. Among them, an important role is played by activist Strike Committee, Maciek Tomczyk (played by Jerzy Radziwiłowicz). Radio journalist, editor Winkel (Marian Opania) is ordered by the deputy chairman of Radio Committee (Janusz Gajos) to achieve coverage compromising Tomczyk. Is sent to Gdańsk, where a representative of the authorities Badecki (Franciszek Trzeciak) realizes the importance of his job. Winkel as a journalist on behalf of the ruling party can not get through the gate of the yard. The crowd in front of the gate of Winkel meets a friend, Dzidka (Boguslaw Linda), which previously got a job in Gdańsk television. Dzidek tells him about Tomczyk, as it turns out - his friend from college. Father of Tomczyk, Mateusz Birkut (hero of the film Man of Marble), then would not allow his son to take part in the student protests in March 1968. Winkel is going to get a pass into the yard. To this end, the family visits Wiesława Hulewicz (Wieslaw Kosmalska), from which he learns of the death of Birkut during the events of December 1970, and in that Tomczyk, he married Agnes (Krystyna Janda), who in 1976 worked on a film about Birkut. Journalist visits unrealized director in custody, which was thrown for supporting the strike. Agnes tells him about how she met Tomczyk and her marriage with him. By the way Winkel argues that the protesters are right for their demands. Winkel decides not to shoot reportage. Finally, a government delegation signs with Inter-Strike Committee agreement. ↑ "Man of Iron". University of California Cine Files. March 1982. Retrieved October 18, 2011. ↑ "Festival de Cannes: Man of Iron". festival-cannes.com. Retrieved 2009-05-31. ↑ "The 54th Academy Awards (1982) Nominees and Winners". oscars.org. Retrieved 2011-10-08. ↑ Anna Walentynowicz, whose sacking led to the rise of Solidarity. The Guardian.